In the cafe of Crystal Leisure Centre, Stourbridge, Arthur told me how no matter how determined he was to get one with his life losing his sight was so isolating, a sentiment echoed by the 5 other swimmers around our table. 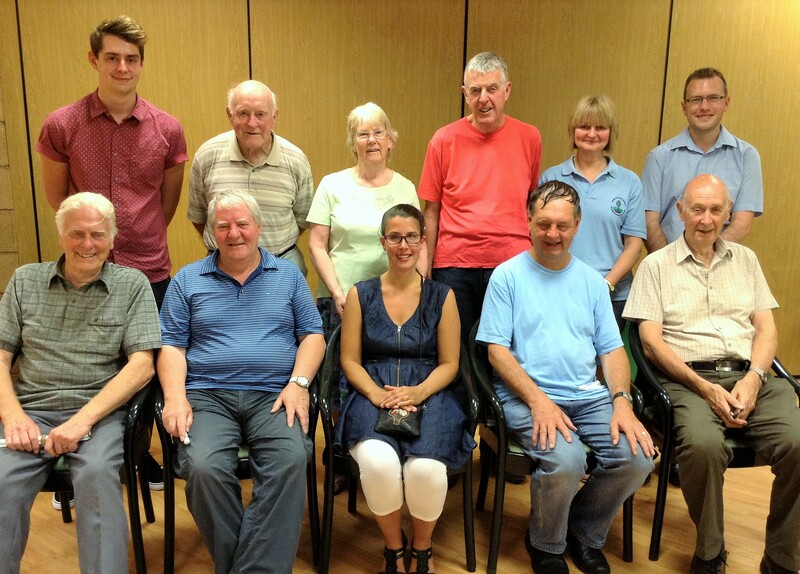 The swimming group, Arthur said, brings him companionship and gives a little respite to spouses and carers. The stories I heard told of how many swimmers who had experienced sight loss enjoyed sports but didn’t do enough exercise; they felt that without the support provided by Thomas Pocklington Trust and its fabulous volunteers, they wouldn’t do any physical activity. But swimming for all (from the terrified to the strong) is only one of the activities on offer now. As part of the project, people can do tennis, bowling, walking and, more recently, croquet; many of the swimmers I met do more than one physical activity. Tennis is hard, I was told; simply hitting the ball is a great satisfaction! The group recently played with Access in Dudley, introducing sighted people to what it’s like to play tennis with sight loss by using special glasses (three of Access in Dudley’s members that played tennis have sight loss themselves, two of whom receive Thomas Pocklington Trust’s Talking Newspaper).The group considered walking the easiest activity but admitted that they wouldn’t do it without the help of volunteers like Gaynor, Graham and Graham. Much of what I was told about participating in physical activity with sight loss reflects Thomas’s Pocklington Trust’s research into ‘Physical activity among older people with sight loss‘. Physical health benefits weren’t the only positives group members enjoyed. Members felt rejuvenated by being able to interact with each other, Brian told me ‘Life’s great now’ and that he ‘feels human’, while Louise told me that she no longer ‘feel[s] like an oddball’ because she’s interacting with people that understand her. I felt a real glow from the whole group as members told me how physically and mentally refreshing the activities are. There’s a real appetite for activities to continue and intensify. The swimming group has had to be divided to accommodate everyone, such is its demand. Some are keen to start other activities such as cycling. In fact, David, who used to tandem-cycle with a sighted friend and once cycled from St Petersburg to Moscow to raise money for Guide Dogs , would dearly love to tandem cycle again, but he’s in need of a cycling partner. Maybe you know someone who could help make that happen! This is just one of the projects kickstarted by the Improving Physical Activity Fund, the result of work between NHS Dudley Clinical Commissioning Group, Public Health Dudley, Dudley CVS and voluntary and community sector organisations to increase participation in healthy activity across the borough. In the coming weeks, I’ll bring you more about other activities happening in Dudley borough and the great impact they’re having. I just had to share this great blog post and these activities wouldn’t happen without volunteers, so why not volunteer for Thomas Pocklington Trust? Thanks for the share, Eileen. And that was quick, too! I had a great time meeting and chatting to the members, volunteers and staff. They were all so supportive of each other. This is such an interesting article, Becky! It’s great to read of the excellent work that the Pocklington do in the community and that so many members are getting the benefit of and enjoying sporting activities. Many thanks for the mention of Access in Dudley. I know our members really enjoyed and learnt so much from the experience. In fact, a couple of our members with sight loss expressed an interest in playing tennis again! Thanks again for such an interesting article! Thanks so much for your kind feedback. I’m really pleased you enjoyed it! It was great to meet the people that took part in some of the activities – they seemed so supportive and encouraging of each other. No problem about the mention – I hope it’s helped people to learn more about the great work Access in Dudley does too and that your fundraising efforts in your anniversary year are going well!